Sometimes a lifelong car collecting hobby begins with the innocuous purchase of a 1:64th scale Hot Wheels die cast at the grocery store. I remember my first Hot Wheels, and I’ve owned literally thousands of the little things in my lifetime. Now, if you have Forza Motorsport 7 or Forza Horizon 4, you can collect them in the virtual world as well with the Hot Wheels expansion pack. Four cars will join both FM7 and FH4, namely Bone Shaker, Rip Rod, Twin Mill, and a track-focussed 2005 Ford Mustang. 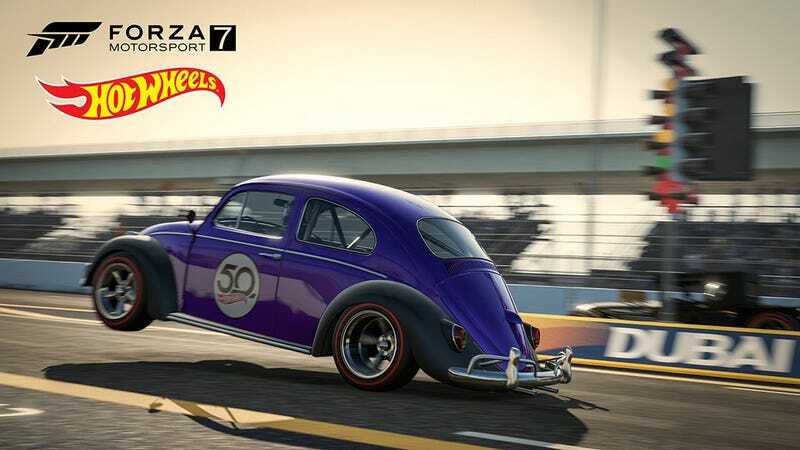 Forza 7's pack will also get access to a 1969 Chevy Camaro SS, a 1970 Chevy Corvette ZR-1, and a 1963 Volkswagen Beetle drag racer, all featuring redline tires, natch. There are also a series of seven Hot Wheels-inspired racing suits for your avatar to wear. Mattell is celebrating the 50th anniversary of the Hot Wheels brand, and this is one of many ways they’re doing so. Now, if you’ll excuse me, I’m going to go rip around the Nurburgring in Twin Mill like a hooligan.